Yesterday, I mentioned that you are now able to use Delta Skymiles on most Westjet flights. It looks like now the reverse is also available. You can now redeem your Westjet Dollars on Delta on select international flights and connecting transborder segments. Your travel must originate in Canada. 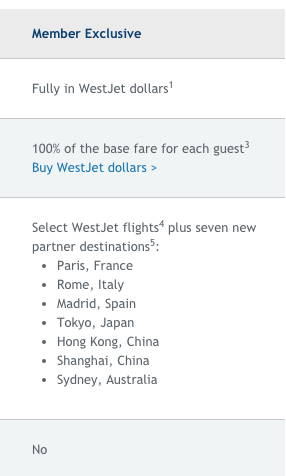 There seem to be fixed Westjet Dollar levels, like $400WSD for Europe. Award availability seems to match what other Skyteam members are given. There are no fuel surcharges, which is nice. You need all the westjet dollars required to make the redemption – so there’s a top-up option offered via points.com, with anywhere from a 3-16% premium. However – this is the big however – you can’t redeem for business class! My idea of a nice getaway is not a 15 hour flight to Sydney, in coach. I hate to say this, but this redemption option is not good at all. It’s awful for anyone who wants to fly comfortably while they travel – but even for families who do fly long-haul coach. There are just so many fare sales and other options instead to accrue transferrable currencies or even cash. The top-up option is also ridiculous, given that a 1 Westjet Dollar is worth 1 Canadian Dollar on Westjet flights. Why would you overpay to top up? I’ve been able to use Alaska Airlines points on Delta flights, but the Alaska-Delta relationship of course is ending on a sour note, and I won’t be able to book Delta flights to US destinations after April 30. Because my home airport isn’t a hub airport like YVR, YYZ, YUL, using Westjet dollars is a viable option for me. Still doesn’t make sense when there are the 2% travel back equivalents in the credit card marketplace, not to mention you can credit WS to AA or DL. This just the beginning. Regarding Business or First, since WS only offer Y on their flight, I don’t forsee a reciprocal agreement with DL on Business Class. However, I’m sure we’ll see more destinations being added, and eventually, we’ll be able to redeem on any DL flight that has N inventory. I’m also hoping for more partners to be added.